An eventful week is behind the German national team as Joachim Löw has announced his final World Cup squad. We have taken a closer look and provide you with an in-depth analysis. On Monday Germany announced their final 23-man roster for the World Cup. Joachim Löw had to cut a final four players from his initial 27-man squad. Among the big questions ahead of Joachim Löw’s press conference at the training base in Eppan, South Tyrol was whether goalkeeper Manuel Neuer would be fit enough to play for Germany at the tournament. The keeper had played the full 90 minutes in the defeat against Austria on Saturday. The keeper looked good throughout the match, and the tenor was that Neuer would have to take himself out of the selection at that point. There was very little doubt about Neuer’s inclusion in the squad. However, instead much of the talk was about Germany’s 2-1 defeat against Austria. In typical fashion, the defeat was the ringing in of the typical German angst ahead of tournaments. The 2-1 defeat, as embarrassing as it was, however, needs to be seen in the light of Germany currently mostly focusing on conditioning at this point, which made any positive result unlikely. Furthermore, Germany almost traditionally performs poorly in friendlies, and the noise that Germany’s star is waning may be a bit premature. But much of the focus on the Germany result against Austria quickly ended when Löw announced the four players that would be cut. The cuts of Bernd Leno, Nils Petersen and Jonathan Tah were widely received with a shrug among the media in Germany – the exclusion of Leroy Sané was at first glance a surprise. The City star, however, never showed his full potential playing for Germany and as our analysis will show Löw will likely have made the right decision. Goalkeepers: Manuel Neuer (Bayern München), Marc-Andre ter Stegen (Barcelona), Kevin Trapp (Paris St-Germain). Defenders: Jérôme Boateng (Bayern München), Matthias Ginter (Borussia Mönchengladbach), Jonas Hector (1.FC Köln), Mats Hummels (Bayern), Joshua Kimmich (Bayern), Marvin Plattenhardt (Hertha Berlin), Antonio Rüdiger (Chelsea), Niklas Süle (Bayern). Strikers: Mario Gomez (Stuttgart), Thomas Müller (Bayern), Marco Reus (Borussia Dortmund), Timo Werner (RB Leipzig). Löw’s final selection did raise a couple of eyebrows and will launch a couple of tactical questions the general public will be keen to see how Löw addresses. The final list of members to Russia, however, already offers an insight of sort into Germany’s tactical vision. This was one of the biggest question marks going into the tournament. Would Manuel Neuer’s foot withstand the rigours of professional football? The keeper had broken his metatarsal for the third time in his career in the fall. A repeated metatarsal fracture belongs to the most complicated injuries, and a repeat fracture could lead to an end of any players career. As a result, Neuer took his time with his rehabilitation and did not play a competitive match before travelling to national team training camp in Eppan. 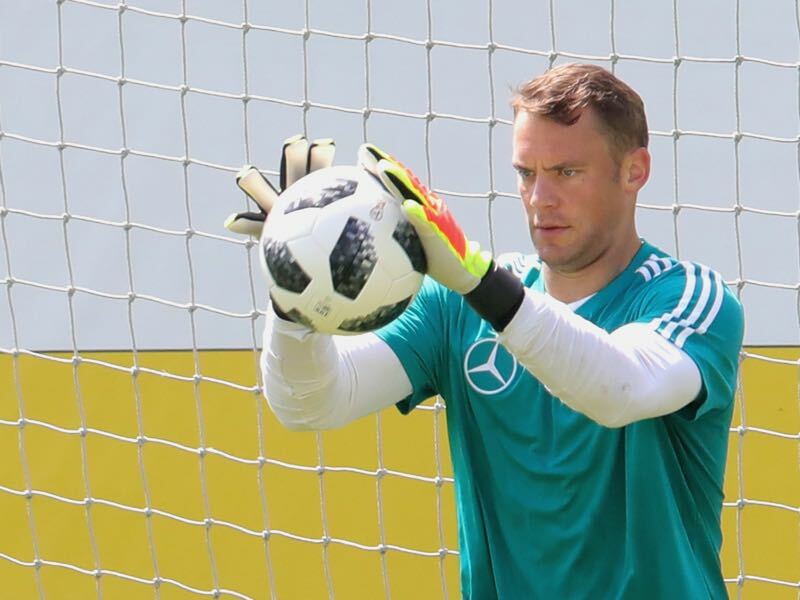 Training sessions in South Tyrol and the match against Austria, however, revealed that Neuer is still is former self and that the foot is once again stable to allow the keeper to play competitive football. Hence, Germany can rely on perhaps the world’s best keeper at the tournament. At the worst case, however, Marc-André ter Stegen would have been more than just a replacement. The Barcelona keeper is perhaps the second-best keeper in the world after Neuer and following the tournament will likely become an open challenger to Neuer’s throne. A small surprise was the nomination of Kevin Trapp ahead of Bernd Leno. Trapp has mostly been the number two keeper at PSG this season. But goalkeeper coach Andreas Köpke is a big fan of Trapp and given that it will be unlikely that Trapp will see any minutes at the tournament nominating a keeper, who is used to the bench role may have been the more intelligent choice over Bernd Leno, who is in an open rivalry with ter Stegen. Here Löw’s analysis may have suggested that Trapp would be better for the overall squad harmony. 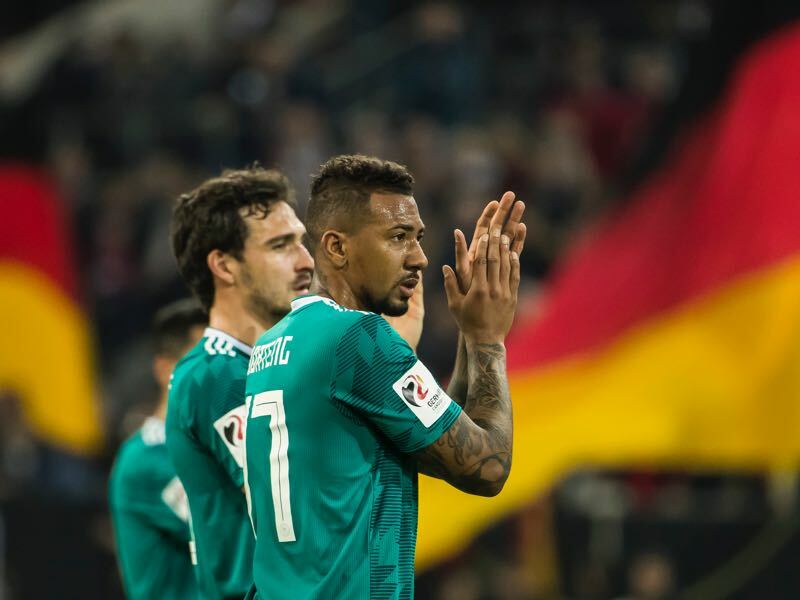 Here Germany had another question mark – would Jérôme Boateng be fit in time for the tournament? The answer is yes, and as a result, Joachim Löw sent home Bayer Leverkusen’s Jonathan Tah. With Boateng, Mats Hummels, Matthias Ginter, Antonio Rüdiger and Niklas Süle Joachim Löw has now five centre-backs in his squad. With five centre-backs in the squad, Löw has the numbers to either play Germany’s common 4-2-3-1 formation or use the 3-5-2 formation that was successfully used at the 2017 FIFA Confederations Cup last summer. Centre-backs Süle, Rüdiger and Ginter were all part of that squad last summer, and the formation was one of the key aspects in Germany’s run all the way to the title. With Hummels and Boateng Löw now has the luxury of adding two defenders to the mix, who in their rights might be among the best in the world. Hence, Germany’s central defensive positions will be all about flexibility, which will be essential to glance over perhaps the only weakness in the squad. Although with Jonas Hector and Joshua Kimmich Germany have two excellent fullbacks Marvin Plattenhardt is yet to show that he can play at the highest level. The Hertha man was part of the 2017 FIFA Confederations Cup but only played one match at the tournament – 90 minutes in Germany’s 3-1 victory over Cameroon. Hence, Plattenhardt will be mostly a backup and our analysis suggests that Löw will be more likely to use either one of the centre-backs on the wide role or switch to a 3-5-2 before relying on Plattenhardt should there be an injury to Hector or Kimmich. While there were questions over Germany’s goalkeepers and defenders, the midfield is one of the strongest areas for die Mannschaft. Here the only slight controversy was cutting Leroy Sané from the preliminary squad. The Manchester City winger has had a fantastic season in the English Premier League scoring ten goals and 15 assists in 32 games. But the winger has managed just one assist in his 12 games for Germany and was one of the weaker players in Germany’s defeat to Austria. The 22-year-old was also supposed to be part of the ConfedCup squad last summer but opted to have surgery on his nose instead. That analysis, however, is wrong. 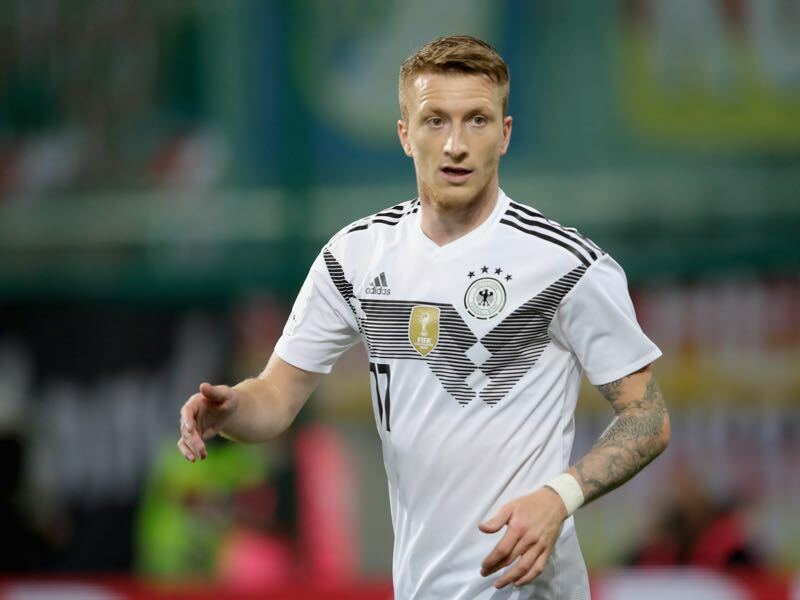 After all, for the first time at a major tournament, Germany will be able to bank on Borussia Dortmund’s Marco Reus, who missed the 2014 FIFA World Cup and the 2016 Euros with injuries. When fit, the Dortmund winger is one of the most exciting players on the planet and is both a goalscoring threat as well as can provide that surprising element while at the same time being better integrated into the side then Sané is at the moment. Joining Reus in the attacking department will be Mesut Özil, who is one of the best players in the world when it comes to packing defensive lines and Julian Draxler. Critiques have argued that Draxler has not seen enough playing time at PSG this season. But a more thorough glance Draxler has played 47 games and scored five goals and ten assists for the French champion. Orchestrating the midfield, in the meantime, will be Toni Kroos. The Real Madrid midfielder won his fourth Champions League trophy in May and might be the best midfielder on the planet at the moment. Kroos hardly ever makes a mistake and averaged a pass completion rate 93.3% in 44 games for Real Madrid this season. 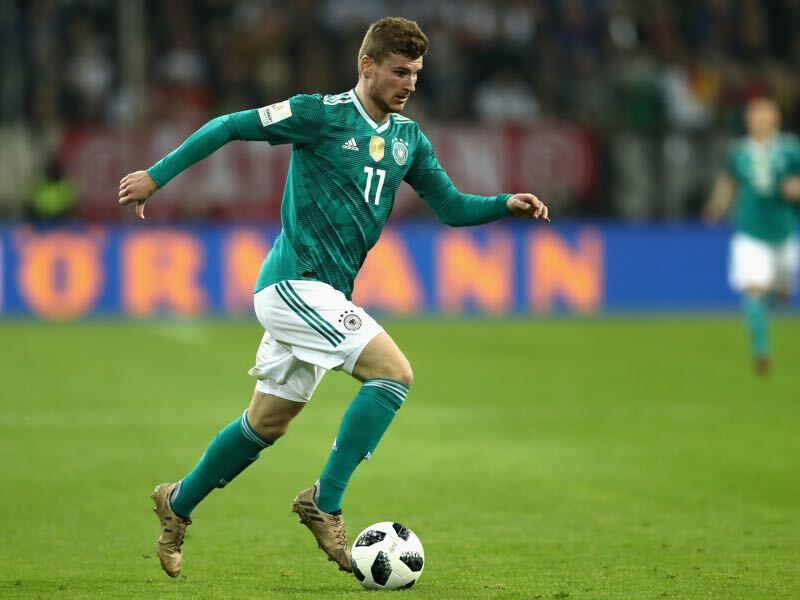 Kroos will be without the metronome in Germany’s midfield and with his ability to dictate the pace and direction of his side and that of the opponent Kroos might be the only player in the squad, who cannot be replaced. Aiding Kroos will be either Juventus’ Sami Khedira or Manchester City’s Ilkay Gündogan. Khedira is the more defensive minded player of the two and Löw will likely opt with the Juventus midfielder when it comes to matches against some of the other top sides. Much of Löw’s pre-match analysis and squad selection will, however, also depend on the formation. Once again, it is possible that Germany could play some of the games using 3-5-2, which would mean that Kroos will be acting as the pivot player in the centre of midfield surrounded by two number eights allowing room for Gündogan and Arsenal’s Mesut Özil to play right behind the two attackers. The 3-5-2 would also answer the question of what to do with Thomas Müller. The Bayern forward can play both as an attacking midfielder or as a second striker. That second position, however, suits him better. Müller will, therefore best suited in the 3-5-2 formation. The attacking midfielder is just six goals short of Miroslav Klose’s record of 16 goals scored at World Cup competitions. Many expect that Müller will get close to the record at this tournament and as a full forward in a 3-5-2 formation his chances will be much improved. On the other hand, in a 4-2-3-1 formation, Müller could be the odd man out among the attacking midfielders. In the 4-2-3-1 formation, Löw’s analysis will likely lead to give RB Leipzig’s Timo Werner from the start. The forward won the Golden Boot at the 2017 FIFA Confederations Cup last summer. Werner scored 13 goals and eight assists in 32 Bundesliga games this season, which is off his pace from last season when he managed 21 goals and seven assists in 31 games. Regardless, Werner will be the main man should Löw opt for the 4-2-3-1 formation. But Werner will be challenged by Mario Gomez. Gomez had a fabulous half season with VfB Stuttgart scoring eight goals in 16 games. Gomez is a more physical forward than Werner and with his international experience could start ahead of Werner when it comes to more experienced sides that have a more defensive outlook. Either way, Germany will have plenty of options up front. 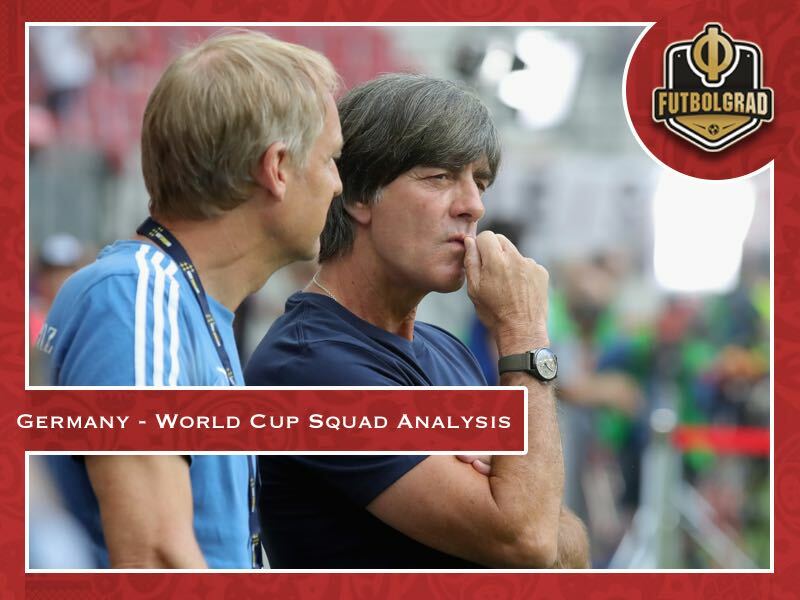 Löw’s squad will provide plenty of options in every part of the squad, and it will be up to the national team staff to provide the perfect analysis to come up with the perfect tactic from match to match.